The compliance deadline for OSHA’s Final Rule on Respirable Crystalline Silica Exposure is suddenly upon us. With less than two weeks left, it’s time to make sure you have all your bases covered. Here’s an overview of the new requirements of the final rule and key facts you should know. The rule installs a new Permissible Exposure Limit. 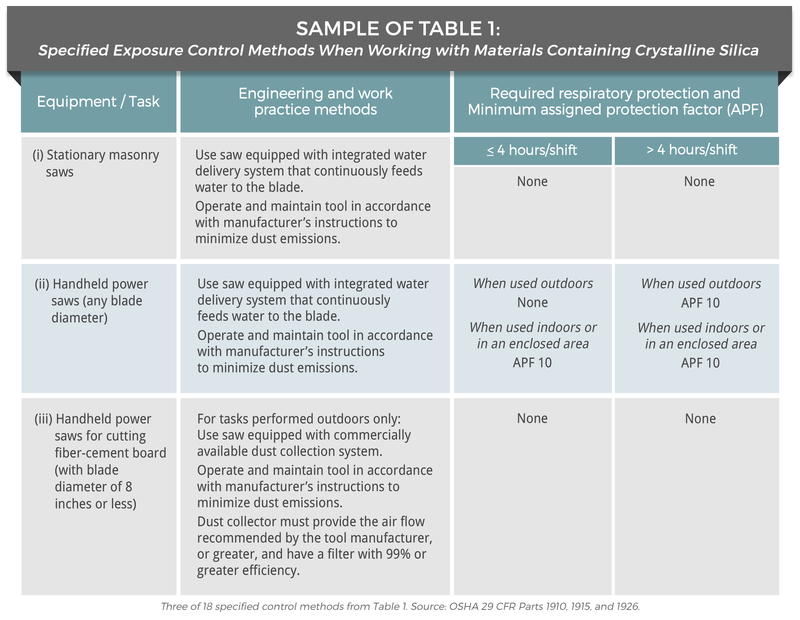 The final rule reduces the permissible exposure limit (PEL) to 50 micrograms of respirable crystalline silica per cubic meter of air (50 µg/) over an eight-hour time-weighted average (TWA). The 50 µg /PEL is the same for all industries. The new PEL is approximately 20% of the previous PEL for the construction industry (approximately 250 µg/) and 50% of the previous PEL for general/maritime industries (approximately 50 µg/. The final rules also introduces an “action Level” of 25 µg/over an eight-hour TWA. Exposure testing is required if respirable crystalline silica exposure could be at or above the Action Level. Exposure assessments may be necessary. The final rules also introduces an action level of 25 µg/over an eight-hour TWA. Employers are required to conduct exposure assessments if workers’ exposure to respirable crystalline silica might reach or exceed the new Action Level. Exposure testing measurements are used to determine what protection measures need to be put in place. Employers must implement and document exposure plans. Create a written exposure control plan that identifies tasks that expose workers to respirable silica and the methods used to protect workers. In the construction industry, employers must designate a “competent person” to implement the written exposure plan. This designated person must be able to identify crystalline silica hazards in the workplace and take corrective action. Limit housekeeping activities (cleaning clothing or silica-covered surfaces) that contribute to silica exposure like dry sweeping, dry brushing and compressed air when alternatives are possible. The standards for general and maritime industries requires employers to limit access to areas where workers could be exposed to respirable silica, and set up regulated areas where respirable silica exposure exceeds the new PEL. The construction standard requires employers to restrict access to work areas with silica exposure risk, but does not require “regulated areas”. Employers covered by the standard for general industry and maritime must offer medical exams to employees every three years if they are exposed to respirable crystalline silica at or above the action level of 25 µg /m3 over an 8-hour TWA for 30 or more days per year. In the construction industry, employers must offer medical—including chest X-rays and lung function tests—for workers who are required by the standard to wear a respirator for 30 or more days per year. Train workers on work operations that result in silica exposure and ways to limit exposure. Employers must also provide and instruct employees on Personal Protective Equipment in some cases. Keep records of workers’ occupational silica exposure and medical exam reports. There are separate standards (and requirements) for the construction industry and general industry and maritime. You should know that the Final Rule actually includes two separate standards: one for general industry/maritime industries and one for construction. The two standards include many similarities, but some requirements vary. If you would like to review the specific requirements for your industry, you can view both standards here. The rule outlines new requirements for surveillance exams, analysis methods and laboratory certification. The rule requires that silica surveillance exams be conducted by a NIOSH-certified technician and must include a tuberculosis screening. Surveillance exams may also include physical exams, a chest x-ray, fit testing and clearance to wear a respirator. There are also new requirements for laboratory certifications and sample analysis methods that can be used to evaluate respirable crystalline silica samples. These new requirements are outlined in the final rule. Employers are required to measure worker exposure to respirable crystalline silica if levels might reach or exceed the new action level of 25 µg/ over an eight-hour TWA. The results of exposure assessments should be used to determine workers’ risk for exposure to respirable silica and to decide what exposure control measures need to be included in the written exposure plan. This requirement stands for both the construction industry and general and maritime industries standards. If several employees perform the same tasks under the same conditions (same work area and same shift), you only need to complete initial exposure monitoring for a representative fraction of those employees. Just remember that the employees you use for representative sampling must be those with the highest expected exposure to respirable crystalline silica. In other works, employers can use the results of initial exposure monitoring for the foreseeable future, unless working conditions change for any number of reasons listed above. The performance option is slightly less demanding on employers, but also carries more risk. This option allows employers can use “any combination of air monitoring data or objective data sufficient to accurately characterize employee exposures to respirable crystalline silica”. In other words, if an employer can provide data that accurately represents employee exposure, they do not have to conduct a new round of exposure monitoring in their employee’s employees actual working conditions. The only issue with this option is that if an employer is using the performance option, “the burden is on the employer to demonstrate that the data accurately characterizes employee exposure”. This means that OSHA can challenge the data an employer provides to measure employee exposure. In the construction industry, employers should conduct exposure assessments for “all occupational exposures to respirable crystalline silica”, unless employee exposure will remain below the action level of 25 µg/ over an eight-hour TWA under “any foreseeable conditions”. The general industry and maritime standard has similar exposure assessment requirements. Employers are also required to measure exposure levels for any “employee who is or may reasonably be expected to be exposed to respirable crystalline silica at or above the action level”. If you are interested in pursuing this exception, be sure to read the full standard before deciding on a plan of action; it seems that there could be some room for interpretation which general industry and maritime tasks would qualify for this exception. The new rule requires that employers use a mix of engineering and work practice controls, administrative controls, and respiratory controls to limit employee exposure to respirable crystalline silica. Administrative controls are the second line of defense for minimizing silica exposure. These controls would include your written exposure control plan, training workers on silica exposure and dust controls, and limiting access to high-exposure work areas. Respiratory controls (respirators) should be used if engineering/work practice controls and administrative controls cannot sufficiently control silica exposure. In this case, respirators should be used to supplement engineering and work practice controls; they should not be used as a first line of defense. Construction employers have two options to decide which exposure control methods they will implement in their workplace. The option you choose will affect the exposure monitoring and compliance requirements for your workplace. Use a control method laid out in Table 1 of the construction standard. This table matches common construction tasks with dust control methods that are known to effectively limit worker exposures to silica. Employers who fully and properly implement the control measures outlined in Table 1 are not separately required to comply with the new PEL or provide separate exposure assessments or methods of compliance. Measure the amount of silica that workers are exposed to if it may be at or above an action level of 25 μg/m3 averaged over an eight-hour day (TWA). 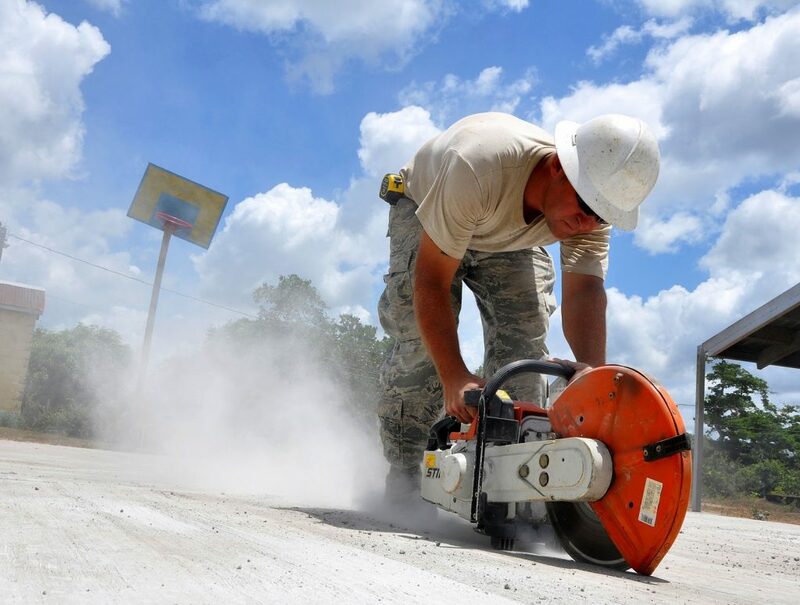 Use dust controls to protect workers from respirable crystalline silica exposures above the permissible exposure limit of 50 μg/m3 averaged over an eight-hour day (TWA). Provide workers with respirators when dust controls cannot limit exposures to the PEL. Table 1 is a central part of the construction industry standard. The table lists 18 common tasks performed on construction sites and outlines control measures, work practices and respiratory protection measures that employers must follow to comply with the new standard. If following Table 1, employers must fully and properly implement all requirements outlined for the task at hand. It is also important to note that the requirements in Table 1 apply to each employee engaged in the task. This would include the equipment operator, as well as helpers or other workers assisting with the task or responsible for completing the task. Employers who comply with Table 1 do not have to conduct exposure assessments or comply with the PEL for employees engaged in those tasks. For tasks not listed in Table 1, construction employers will need to conduct exposure monitoring if employee exposure might reach or exceed the action level of 25 µg/ over an eight-hour TWA. The results of exposure monitoring will help you determine which engineering, work, administrative, and respiratory controls you’ll need to adopt for those tasks. (ii) Handheld power saws (any blade diameter). (iii) Handheld power saws for cutting fiber-cement board (with blade diameter of 8 inches or less). (vi) Rig-mounted core saws or drills. (vii) Handheld and stand-mounted drills (including impact and rotary hammer drills). (viii) Dowel drilling rigs for concrete. (ix) Vehicle-mounted drilling rigs for rock and concrete. (x) Jackhammers and handheld powered chipping tools. (xi) Handheld grinders for mortar removal (i.e., tuckpointing). (xii) Handheld grinders for uses other than mortar removal. (xiii) Walk-behind milling machines and floor grinders. (xiv) Small drivable milling machines (less than half-lane). (xv) Large drivable milling machines (half-lane and larger). (xvii) Heavy equipment and utility vehicles used to abrade or fracture silica-containing materials. (e.g., hoe-ramming, rock ripping) or used during demolition activities involving silica-containing materials. (xviii) Heavy equipment and utility vehicles for tasks such as grading and excavating but not including: Demolishing, abrading, or fracturing silica-containing materials. When is the deadline to comply? Both the construction industry and general industry and maritime standards took effect on June 23, 2016. However, OSHA has delayed enforcement for the construction industry so they could conduct additional research and create guidance materials for employers. OSHA will now begin to enforce their final rule for the construction industry on September 23, 2017. There final rule will be phased in with several different compliance deadlines for the construction industry, general industry and maritime, and hydraulic fracking. All affected industries are required to comply with their respective standard by June 23, 2021. Use the table below to find the compliance deadline for your workplace. 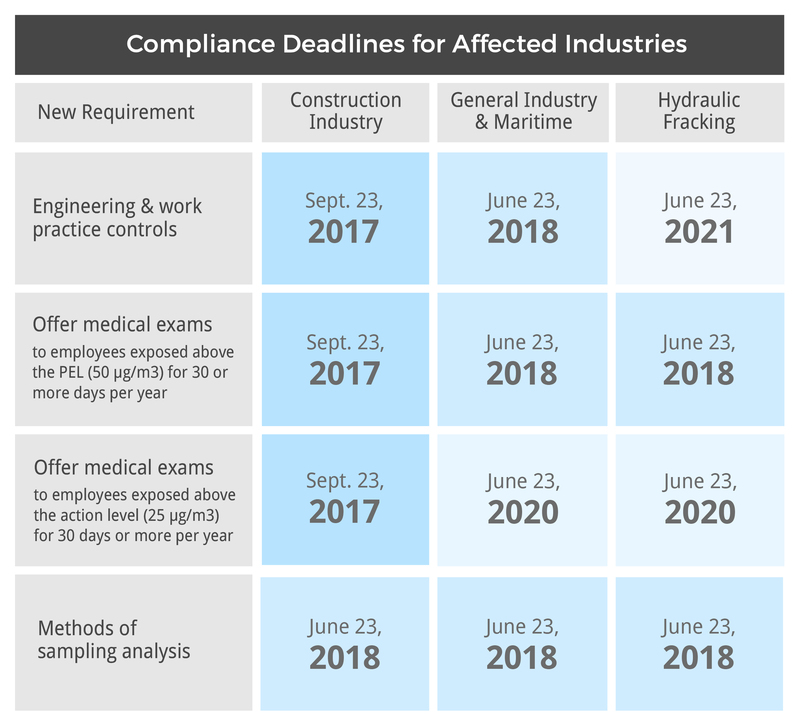 OSHA has announced these compliance deadlines for its final rule on Occupational Exposure to Respirable Crystalline Silica .